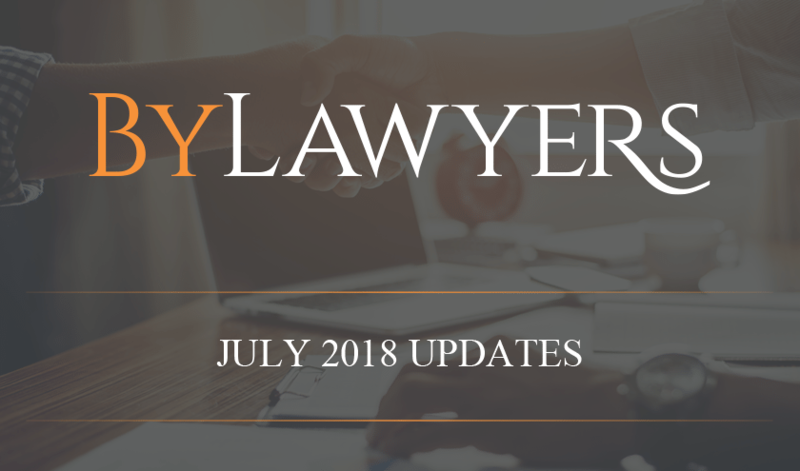 July was a very busy month for By Lawyers, with new publications, articles, many updates and enhancements, and even a podcast. The focus of this explanatory article is the electronic settlement process – currently available via PEXA, but soon also via SYMPLI, a joint venture of InfoTrack and the ASX. Our article assists subscribers who are yet to get their heads around electronic conveyancing by providing a brief overview of the PEXA process that follows exchange and requires all participants in the transaction to have been identified, be registered and have a PEXA digital certification that entitles them to transact electronically in what is known as a ‘workspace’. All states – Electronic conveyancing – Are you ready? Our matter plans have been split after ‘Mid transaction’ into ‘Paper transaction – Through to settlement’ and ‘Electronic transaction – Through to settlement’. Our precedent letters have been updated and where necessary new precedents included to cover electronic transactions. We are working hard to help you make a seamless transition to the new regime. A special disability trust can be established to specifically provide for the care and accommodation of a family member with a severe disability. If compliant with the statutory requirements it will allow the disabled beneficiary of the trust to retain their full pension entitlement. There are also generous concessions for contributions to a compliant special disability trust. Our wills guides now includes detailed commentary and precedents covering special disability trusts. All of our wills precedents have been updated to include a clause that directs the executor as to the testator’s wishes for their remains. This clause is automated in LEAP. Where the instructions are more detailed, the Burial, Cremation, Medical Research Provisions clauses from the Library of Clauses, Deeds, Contracts and Codicils are also available. Our Retainer Instructions already include a section for burial, cremation and medical research, so that the testator’s wishes can be discussed and recorded. All By Lawyers costs agreements and client service agreements have been enhanced within the Billing and payment arrangements section now including two-factor verification protocol and an authority for alternate payment options, providing additional protection for law firms. There are many different property development projects for which a joint venture structure may be suitable. To help you establish these projects for your clients, By Lawyers have added a new precedent: Joint Venture Agreement – Townhouses development project, located in our Joint Ventures Guide. The By Lawyers Joint Ventures Guide ensures that practitioners can feel confident drafting agreements that capture the full complexity of their clients’ property development projects. Helpful new commentary on calculating penalty units has been added to the By Lawyers criminal guides and to our Practice Management Guide. Information is provided about what a penalty unit is in each state and how to calculate the monetary penalty for various breaches of laws. Of course, we will ensure that these values are updated when required, across the jurisdictions, so you don’t have to worry about it. Areas in this useful reference guide which have been enhanced include: Client service and communication standards, Cost disclosure and billing practices, Supervision of practice and staff. We have also included a new resource, 101 Trusted and useful sites by area of law. Here at By Lawyers we spend a lot of time researching and fact-checking, in all of the areas of law that our publications cover. Over time we have compiled a list of credible and helpful websites which we regularly use – and that list is now available to you. Our 101 Policy and Procedures Guide assists firms with all aspects of the business of running their legal practice – and in advising clients how to set up and document systems for running their businesses. Along with the amendments to our wills guides, we have also expanded our comprehensive Companies, Trusts and Partnerships Guide to include commentary and precedents covering special disability trusts. Our commentary has been updated and enhanced to help you get on top of developments in this still-emerging area of law, relevant to clients who conduct businesses in various industries. By Lawyers Security of Payments Guide is a separate publication on our website, or for LEAP users is located in Other Areas of Law – Building and construction disputes. Queensland has introduced special drug and alcohol sentencing options where the Court determines whether the offender and the community would benefit more from the offender participating in a rehabilitation and treatment program than from imprisonment. Commentary explaining the availability and operation of drug and alcohol treatment orders was added to our Magistrates Court Criminal and Traffic Offences guides. We were delighted to release another comprehensive step-by-step guide for South Australian practitioners, covering all aspects of criminal practice and procedure, for both summary and indictable offences, when acting for the defendant in criminal proceedings in the Magistrates Court. This guide assists practitioners with all aspects of conducting a criminal matter from arrest and bail, or a first appointment in the office, through to hearing and/or sentencing, including avenues of appeal and possible costs applications. The commentary is practical and easy to understand, with numerous helpful precedents and all current Magistrates Court forms included. The By Lawyers Contract of Sale of Land is available to LEAP users via the Conveyancing & Property – Sale matter plans. Our commentaries have been updated to deal with recent amendments to the Family Violence Protection Act 2008 made by the Bail Amendment (Stage One) Bill 2017. Our Criminal Magistrates’ Court Guide has been updated following the extensive reforms to bail in Victoria which came into operation recently. Our Victorian Civil Litigation and Injuries author, barrister Nawaar Hassan, reviewed the County Court publication including commentary, matter plans and precedents. Various enhancements were published in June, including expansion and clarification of commentary relating to various aspects of conducting litigation in the County Court.